Harry is a Border Terrier. He was born in July 2000, and was named after Harry Potter. His pedigree name is Bramble Keeper. He enjoys walking, and playing games with golf balls and sticks and doing this blog. First time I have seen Harry quite so close to Pushkin. 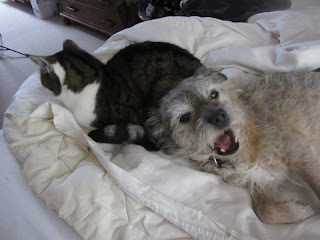 Harry yawns on waking with his head resting on Pushkin. Pushkin has a facebook page where he says things like "Debating on differnt (sic) ways to get away with hitting the little brother Harry..." but actually he is not that bad. I think he just says things like that for show. Cat has to keep up the image. So does Harry, of course. But sometimes you just need a warm, furry pillow. I wish Daphne, our family cat, would let me snuggle up so close! - alas sometimes she prefers my bed it seems and I have to simply look on and wait for her to vacate it! I agree, cats are very image conscious, and I am so kind and chivalrous, letting her rest in my bed like that! - great to see you again Harry, I always look forward to it!